On Jan. 24, 2014 my cousin suddenly felt light headed while taking a shower. She tried opening a window for some fresh air, hoping it would quickly restore her strength. When that didn’t help, she reached desperately for the towel rack for support. Feeling light headed again, she tried to quickly get out of the shower. She took one step out of the tub and the next thing she remembered was opening her eyes to find herself sprawled on the rug by the bathroom sink. Thankfully, her brother was close by and heard something unusual. He rushed into the bathroom where he found his sister on the floor crying and the shower still running. He immediately called 9-1-1, but as he dialed the numbers she wanted to stop him and say, “No, don’t call.” Knowing that she didn’t have health insurance and having heard the stories of horrific hospital bills, she did not want to fall victim. But she knew she wasn’t in any condition to take the risk of passing out again and possibly not waking up. The ambulance arrived and escorted her to the closest hospital, only five minutes away. She was given four blood transfusions. Considering this was her first time in the hospital as a patient, she had no idea how much this would cost and was almost oblivious of what would come after her discharge. Her mother was deceased, her father unsupportive and she was a full-time student in search of a part-time job. Before her hospitalization, she attempted—multiple times—to apply to the Health Insurance Marketplace, only to find that she did not qualify for subsidies on the private market or for Medicaid – the type of insurance that would have benefited her the most (she lives in a state that chose not to expand its Medicaid program). The Affordable Care Act provides states with additional federal funding to expand their Medicaid programs to cover adults under 65 with income up to 138 percent of the federal poverty level. However, in June 2012, the Supreme Court ruled that states could not be forced to expand their Medicaid programs. According to the Kaiser Family Foundation’s report, “Status of State Action on the Medicaid Expansion Decision,” 30 states (including DC) adopted Medicaid expansion, 4 states are in discussions with the Obama administration and 17 states are not adopting Medicaid expansion. The states that opted out of Medicaid expansion believed it would be detrimental to their state. For example, according to Florida Governor Rick Scott, expanding Medicaid would strain state budgets. Although the federal government will pay 100 percent of the expansion until 2016 and 90 percent until 2020 and beyond, Governor Scott believes this still leaves state taxpayers responsible for about $5 billion over a 10-year period. Nevertheless, there is overwhelming evidence showing that not opting into Medicaid expansion is detrimental to the poor. If adopted by all 50 states, as many as 21.3 million Americans would have access to health care by 2022 through the Medicaid expansion. States would see a reduction in the cost of uncompensated care and spending for some other state programs. My cousin would have been eligible for Medicaid had her state expanded the program. However, the state did not. She did not have enough earnings to be eligible for premium tax credits to purchase coverage through the health insurance marketplace coverage. She falls in the coverage gap. 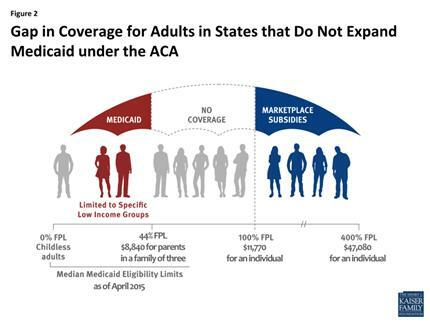 According to the Kaiser Family Foundation, in states that have not expanded Medicaid, 3.7 million poor uninsured adults fall into a “coverage gap,” and will likely remain uninsured. The majority of people in the coverage gap are working poor. They are working either on a part-time or full-time basis but are still living below the poverty line. As for my cousin, her follow-up appointments included additional tests, labs and even follow-ups to cancer sites. After calculating the costs of just her initial visits to follow up—without any tests or lab work, just for the doctor first time patient fee—the total came close to $600. This means she would need to have an additional $100-$300 on hand to pay for the additional tests at checkout, after seeing her doctors. Then the medical bills began coming in. They started trickling in here and there, some close to a thousand, others in the hundreds. She thought, “That’s not bad; maybe I’ll be able to set-up a payment plan and everything will get paid off.” Then she received the largest bill yet for $38,376. So at the prime age of 24, with no children and no spouse, and working on her undergraduate degree, she now has a total debt of close to $65,000. My cousin is just one among millions of people in a similar, if not worse, situation. After the enactment of Medicaid in 1965, it took 17 years for every state to pass and implement the program. Let’s hope that for the sake of people like my cousin, it doesn’t take nearly that long for the remaining states to expand Medicaid. We can’t afford to let politics get in the way of progress, especially when so many Americans’ lives and livelihoods are at risk. Author: Jean C. Accius, Ph.D., P.M.P., is a national expert in aging, health and long-term care policy. Dr. Accius is an adjunct professorial lecturer in the Department of Public Administration and Policy at American University in Washington, D.C. He can be reached at [email protected].